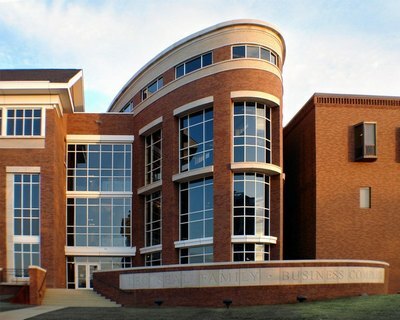 Founded in 1915, MSU’s College of Business is recognized as one of the oldest business schools in the South. The fully-accredited College of Business offers programs that lead to bachelor’s, master’s and doctoral degrees and is the home to nearly 3,000 graduate and undergraduate students. The College of Business, with its strong team of dedicated faculty and staff, is committed to providing students with the finest educational experience. We embrace innovation in the classroom and continually strive to offer cutting edge programs and courses to provide our students with real-world experiences prior to graduation. We invite you to experience the difference in the College of Business. Admission to Mississippi State University's graduate business program, the school notes, is "based primarily on results of the Graduate Management Admission Test (GMAT), GPA over the last 60 semester hours of baccalaureate work, and past work experience." The school employs a formula to establish minimum criteria for applicants; that formula is ...Admission to Mississippi State University's graduate business program, the school notes, is "based primarily on results of the Graduate Management Admission Test (GMAT), GPA over the last 60 semester hours of baccalaureate work, and past work experience." The school employs a formula to establish minimum criteria for applicants; that formula is (200 × GPA for final 60 undergraduate credit hours) + GMAT score. All applicants need a score of at least 1110. The school's website states, "Some exceptions to these standards may be granted based on the strength of other materials contained in the student's application." Mitigating factors may include the required letters of recommendation and personal statement. MSU visits a number of minority schools in its efforts to recruit underrepresented minority students. Mississippi State University provides MBAs with a "very intimate setting, since the school makes up the majority of the town." Students love the "small-town setting and college atmosphere," telling us that "the southern charm and friendliness that surround you are the greatest strengths of MSU." Like many other southern schools, MSU has "a great sense of tradition that is upheld very well" by students, faculty, and administrators alike; also like its peer institutions, it is crazy for intercollegiate athletics, particularly football. One MBA explains, "For the sports lover, we have plenty of activities like tailgating at football games. There are activities for many sporting events here." Another student adds, "You just can't match the atmosphere of the ‘Left-Field Lounge' for college baseball. "Within the College of Business, the MBA Association is the most active force in extracurricular life. It "organizes intramural football, basketball, and softball teams and usually organizes an MBA Social every few weeks. The socials are usually held at local bars and restaurants, and they really give students an opportunity to get to know each other." Students also have access to "more clubs and other organizations than you can count, outdoor sports and recreation, and a very supportive local community." They love the "beautiful campus [and MSU's] state-of-the-art fitness facility that houses a weight room, eight basketball courts, a walking track, climbing wall, pool, and about 10 racquetball courts. "Most of all, though, they love the tight community formed by this small MBA program. One student describes the relationship dynamic, "You form such bonds with your classmates that you spend your outside time with them as well. It is a very tight-knit group. You spend a lot of time at the MBA lab working on projects, but it is well worth it." Another student relates an atmosphere that "is very much like a family. Classmates in general are supportive. I love the people that I am in class with. The school is very laid-back and a fun place to be." Placement services for Mississippi State business grads are handled by the university's Career Center. The office provides all the standard career services: career counseling, job fairs, seminars, workshops, interview books, career days, and access to online job databases. But because it serves 15,000 students, it doesn't have much time to tailor services specifically to the school's more than 300 business grad students. One MBA notes, "The biggest improvement this school could make would be to get a better career-placement office. The current office is more geared toward engineering than business." Another student offers, "The school could improve in the areas of possible internships for students within the course of the program." On the plus side, the Career Center can put students in contact with MSU's considerable alumni network.Companies that most frequently employ MSU MBAs include Amsouth Bank, BellSouth, Cintas, Exxon Mobil, International Paper, JCPenny, Shell Oil, and the U.S. General Accounting Office. The MBA program at Mississippi State's College of Business and Industry takes a broad approach to graduate business education, stressing general principles and de-emphasizing details. The idea is to expose students to a broad range of business theories and practices, a methodology students appreciate; as one put it, "The greatest strengths that I have encountered here lie in the fact that the MBA program allows students to experience and learn all aspects of business that will affect them in the future." Another student agrees, "The well-rounded design of the program is very strong. Courses are offered in every aspect of managing a business." Only a few students complain that "more in-depth material could be covered instead of the basics. "MSU's MBA program is small, resulting in "an excellent learning atmosphere in each class [and] lots of personal attention." One MBA notes, "Every professor I have had knows who I am, where I'm from, and what I want to do with my life. It's comforting to know that someone cares whether or not I am in class." Another student adds, "All of the professors are willing to help each student in class and outside of class. Many will take away from their own time and go out of their way to help a student. I know that I have become more competent and more prepared for the business world because of my experience here at Mississippi State. "MSU's program is flexible enough to accommodate both full-timers and part-time students with full-time jobs. In fact, Mississippi State's internet based distance learning program allows students to complete the entire MBA and MBA-Project Management degrees from anywhere. The school offers a wide range of business degrees, including the MBA, an MS in business administration, a master's in professional accountancy, a master's in taxation, an MS in information systems, and several PhDs. The most popular fields of specialization include finance, general management, and operations. The MSU Libraries support research through the provision of a state-of-the-art instructional media center. Multi-media software and computer terminals are available to students; workshops are offered free of charge. The MSU Libraries also offer a large collection of government and United Nations depository material, including a large number of statistical CD-ROMs and online resources. Richard C. Adkerson - President and CEO of Freeport McMoRan Copper & Gold, Inc.
Want more info about Mississippi State University, College of Business Full Time MBA? Get free advice from education experts and Noodle community members. What professional development opportunities are available for MBA students at Mississippi State? What are the pros and cons of the Full Time MBA program vs. the Online Degree? Mississippi State’s Distance MBA program is fully online and fully accredited. Indeed, it has earned AACSB accreditation, which means it’s in the top five percent of MBA programs worldwide.